Thala Ajith's new image from Vivegam was released on Twitter by director Siva. 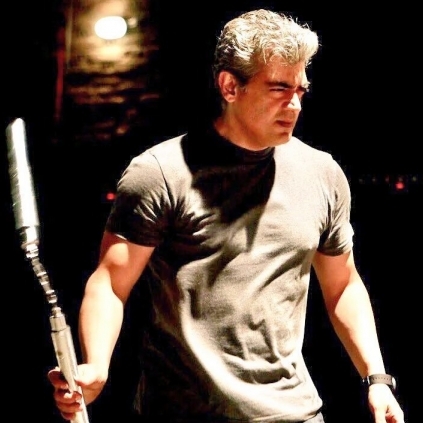 The image had Ajith practicing the martial art using a nunchaku (a martial art weapon). Ajith's fitness is one of the most talked about topics in town today for all his fans and contemporaries. There are two sayings in Tamil which writer/lyricist Kabilan Vairamuthu reminded us about, on Twitter, that is apt for Ajith. He says, ''உடலினை உறுதி செய் - உடம்பை வளர்த்தேன் உயிர் வளர்த்தேனே போன்ற பொன்மொழிகளுக்கு தல அஜித் அவர்கள் நவீன உதாரணம்.'' Translated as - Ajith is the perfect example for ''Keep your body strong'' and '' My life got better when I built my body' sayings. All the images from the film, released by the team are taking the internet by storm every time. The expectations for the film are rising higher every time any update is given on the film. The shooting is yet to be completed and the team is in their final schedule. The music has not come out, no teasers, no trailers yet, but the whole of the industry and the fans are awaiting the release of this film just to see Ajith's new avatar and to see something new and fresh on foreign soil by the Veeram-Vedalam combination. We need to wait and see if Siva will release a trailer for this film or restrict it to just one teaser and a number of images because that was the case with the combo's previous outing, Vedalam too. Anirudh's music also said to be his first release in 2017 is expected to be of international standards and there is a lot on his shoulders to carry and satisfy Thala fans. Want to know who Sachin Tendulkar found it difficult to impress? People looking for online information on Ajith, Ajith Kumar, Anirudh Ravichander, Siva, Vivegam will find this news story useful.